Among the Memorial Villages, Hedwig Village real estate have posted some of the most impressive appreciation rates in the past 10 years. Collectively, real estate in the Memorial Villages – Piney Point, Bunker Hill, Hilshire, Spring Valley, Hunters Creek, and Hedwig – have a 10-year appreciation rate of 71%. The median sales price in Hedwig Village has more than doubled over the last decade, marking a 142% positive change. Hedwig’s rate of appreciation has surpassed even the hottest Inner Loop neighborhoods. Hedwig Village is unique among the Villages in that the city allows commercial establishments within its borders. With only 0.9 square miles of land area, the city’s homes and lots are smaller compared to ones in Piney Point and Hunters Creek. The city offers a variety of options, from newer mini-mansions to older ranch-style homes. 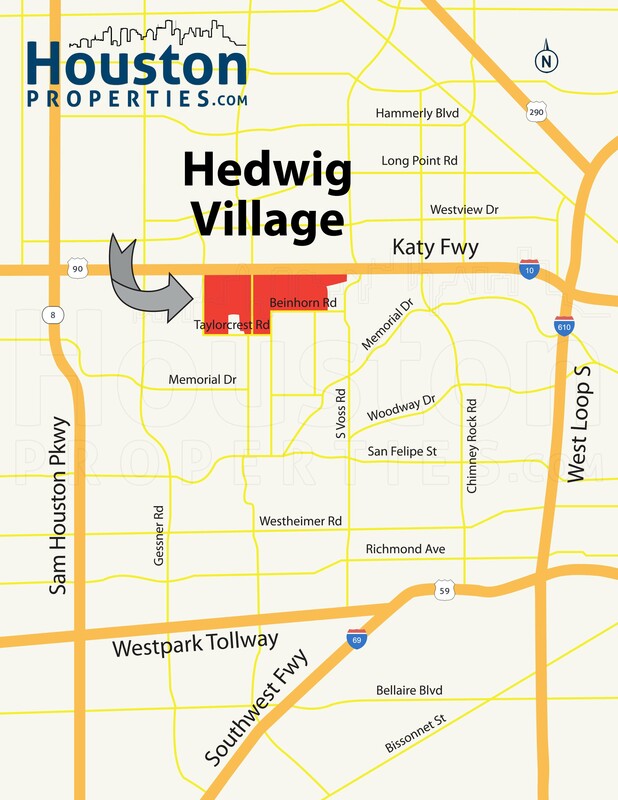 Hedwig homes for sale are in constant demand due to their great location along Katy Fwy, proximity to award-winning schools, and easy access to business, entertainment and retail hubs. For questions, advice, Hedwig Village TX real estate recommendations, or off-market MLS listings, contact Paige Martin, head of the Houston Properties Team and rated as the best Keller Williams Memorial realtor the last four years. For an updated and customized Hedwig real estate pricing or trend analysis, please contact Paige Martin at Paige@HoustonProperties.com. 1. Hedwig home prices have increased by 142% over the last 10 years. From $737,500 in 2005, the median sales price in Hedwig increased to $1,787,500 in 2014. This upward trend has been consistent, evidenced by Hedwig real estate’s 71% growth over the last 5 years. 2. Hedwig’s real estate appreciation doesn’t show signs of slowing down. Hedwig real estate show a 29% increase from 2013 to 2014. High demand, low inventories, along with new construction custom-built homes, have driven prices up. 3. 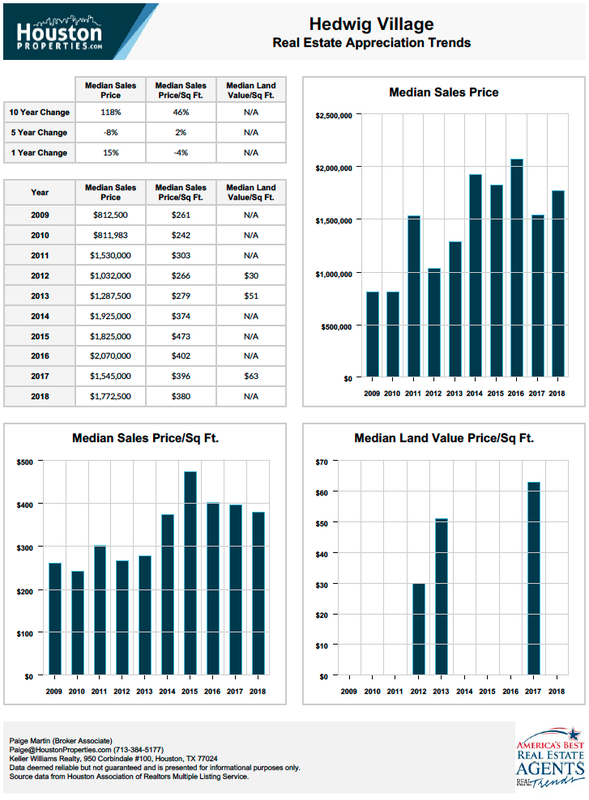 Lot prices and average price per square foot have also show positive 10-year change. The average price per square foot of Hedwig homes are at $368 in 2014, from $225 in 2005 – a 64% increase. Lot price per square foot, on the other hand, has increased by 143%, from $21 in 2005 to $51 in 2013. 4. Prices tend to fluctuate in Hedwig Village. Slight changes in homes prices doesn’t equate to an unstable real estate market. A number of factors, including the age of the home and location, contribute to pricing. Older Hedwig homes tend to sell for much lower prices or are sometimes sold as lots, while newer homes tend to go for higher price tags. Paige is ranked as one of the top realtors in Hedwig Village, Houston, and the state of Texas. Read more about the over 65 awards she’s won in the last few years. Paige works with a tremendous number of buyers and sellers in Hedwig.